The new Ford Kuga arrives with a vast improvement over its predecessor as the dynamics and space are sure to give its competitors a a run for their money. One of the better SUVs all-round, the new model gets subtle designing. The rear gets softer and nose a little less distinct. This is actually the first foray by Ford into the mini-SUV market. The new Ford Kuga is sold all over the world today. The second generation model is much more spacious and is loaded with new technology. Kuga has undergone more than thirty thousand virtual tests in seven countries under extreme temperatures so as to offer optimal performance. 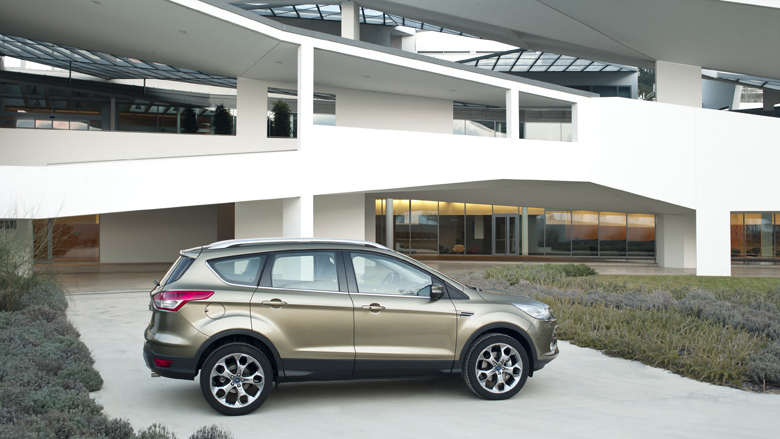 The new Kuga is definitely smarter, combined with innovative technology. Here is a brief new Ford Kuga review. When you look at the new Kuga, you will see that the high windows remain and it looks more slab-sided and conservative on an81mm longer wheelbase. A look inside and you can’t help noticing the spacious interiors. The view in the rear view mirror is so long that you feel like sitting in a van. The passengers in the rear will appreciate the extra legroom and the boot space too gets increased to 456 liters. You will find the use of good quality plastics, and positive feeling switches. The inserts on the interior door-grabs and the plastic that surrounds the handbrake make for some nice touches. New Ford Kuga comes in two engines, turbocharged 2.5-litre petrol and a 2.0-litre diesel with 200bhp and 135bhp receptively. The engine rumbles into life once you push the crisp little ‘Ford by turning in the key. This is a thoroughly well-engineered machine that gives one a complete German feel and offering just the right level of performance. The ride is comfortable and there are no complaints. The diesel engine is as quiet and never seems to get ruffled. The engine will pull on strongly and smoothly and the CO2 emissions of 154g/km means road tax of £170, which is just about average. The fuel economy ranges from 44.1mpg to 47.9mpg. With a 5 Star Euro NCAP rating, the new Ford Kuga 2013 offers 86% child protection, 94% adult protection and 70% pedestrian protection. This is great numbers for safety assist. Other safety features include Lane Departure Warning system, SYNC with Emergency Assistance and blind-spot detection. The new Kuga also makes use of smart technology that offers adjustable speed-limits, thus offering more confidence and assurance to the driver. The model achieves the maximum ever overall protection for mid-sized SUVs. Summing up new Ford Kuga review, the mini-SUV won’t take you up mountains, nut it arrives as amore competitive model. It is better equipped and is now bigger, carrying sharp driving dynamics. The best combination is the 2.0-litre TDCi diesel engine with the manual gearbox. The Kuga has its strengths but may not be a threat to the best cars in the segment. The SUV will ride beautifully and the only issue is the increased centre of gravity. With an electro-hydraulic set-up for the steering, Kuga is a practical and impressive car. Getting long life service intervals should not be a problem, as with all diesels. It has been developed to offer the best driving experience and with utmost efficiency. This is what makes the new Kuga the Smart Utility Vehicle.